Heat oil in a pan. Add mustard seeds, hing and slit green chilli. When mustard seeds start crackling, add tomatoes. 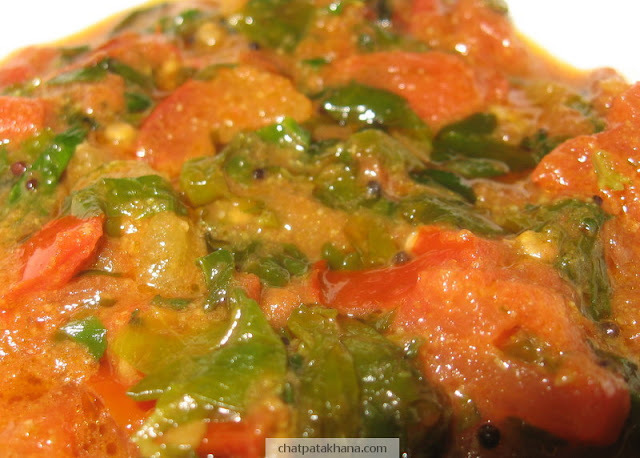 Once tomatoes are soft, add methi leaves. Add the spices and some water. Cook it with the lid covered for 10 minutes or till desired consistency. Goes well with parathas. Can be used as a chutney also. Tip:To overcome the bitterness of methi, you can soak it in slat water for 15-20 minutes prior to cooking.